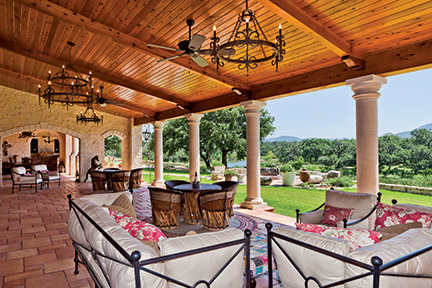 Just recently I had the pleasure of working on a remarkable ranch in the Texas Hill Country. 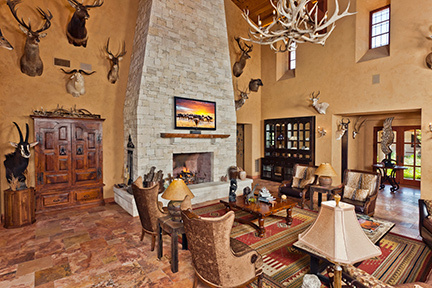 The ranch belongs to John and Betty Martin, two extraordinary people with impeccable taste. The Martins live in the hustle and bustle of Katy, enjoying life with children and grandchildren. One thing that they share as a family is their appreciation of nature. In addition to raising trophy deer and exotic animals, they love to hunt and fish. They also take long nature walks in search of arrowheads, fossils and other treasures which they often incorporate into their own designs on walls, walkways and patios. 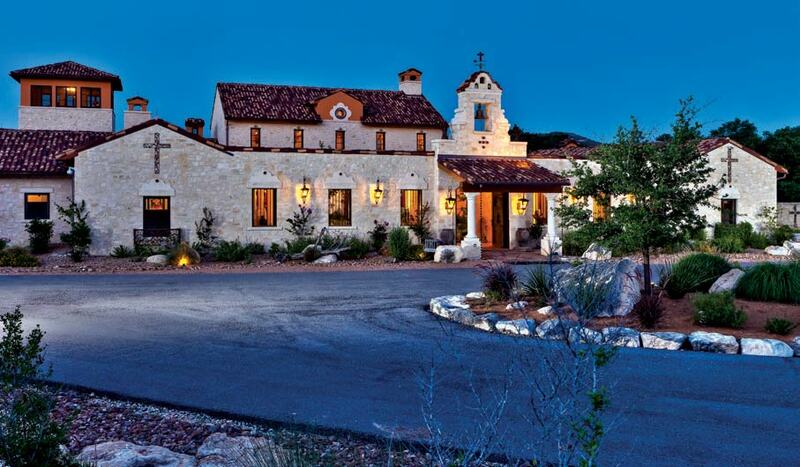 Catrina adorned a glittering Hill Country Hacienda and everyone went to the ball. 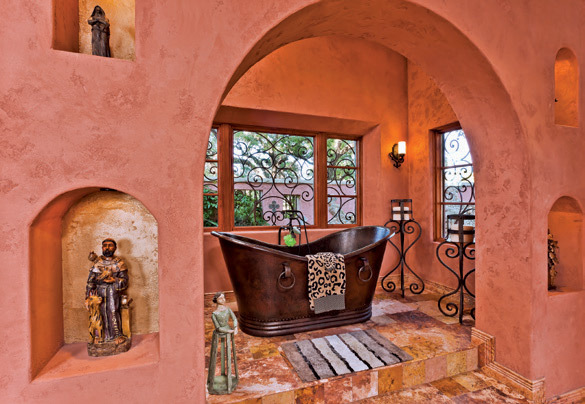 Having found this remote corner of God’s country, it would not be easy to find a builder who could be on site daily and truly listen to the specific directions, details and overall vision of how this “San Miguel de Allende” style ranchero was to be constructed. Would it prove to be impossible? Not with a little luck, and a whole lot of Girl Power! The amazing Betty Martin ended up with an equally amazing builder named Judy Ramsey. 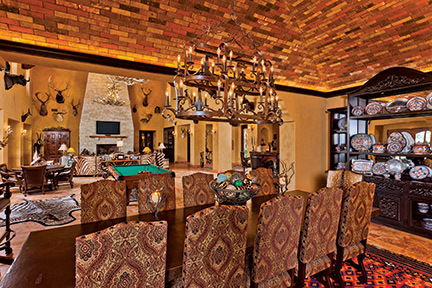 This woman rancher, who raises exotic animals and trophy deer, is involved in real estate, leases her ranch for hunting and builds high end “casas” for the most discerning clients! Heck, she builds great little cabins too! When Catrina’s Ranch Interiors became involved with the ambitious project, and I first viewed the blue prints and renderings, I was speechless. 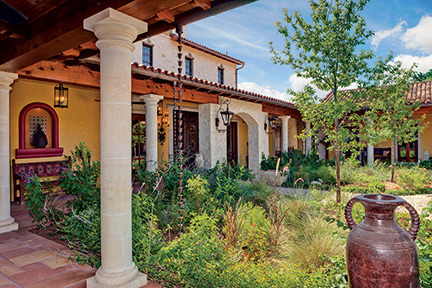 The plans were for a 17,000 square foot home built around a central courtyard. The courtyard had a bell tower over the front entrance gate; a real one.The main house had an observation tower that overlooked the dammed up river and a picturesque view of Heaven on Earth. There was a magnificent outdoor kitchen off of an enormous porch. The plans showed a large, ornate, fountain in the middle of the central courtyard. This home was to have all the bells and whistles, with unimaginable details, while sparing no expense.It would take two years to build and finish. Judy, Betty and I had many meetings over the next two years. We designed and built 58 chandeliers and sconces, indoors and out. 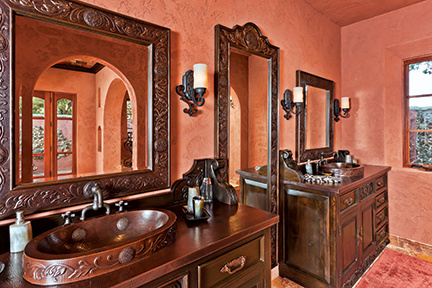 We designed and built custom doors, custom cabinets, custom kitchens and candle holders. “If you can dream it, we can build it” is Catrina’s Ranch Interiors’ motto and, as always, we delivered on this promise. I like to think of myself as a “Can Do” kind of girl, but this job tested my abilities on a regular basis. Antler chandeliers measuring 7 ft. by 7 ft. would be no problem! Hammered copper panels in the cabinet doors? Not a problem! I have much to tell you about this experience, but nothing says it better than the stunning color photographs taken by San Antonio’s most famous magazine photographer, for Urban Home Magazine’s next issue. See for yourself. 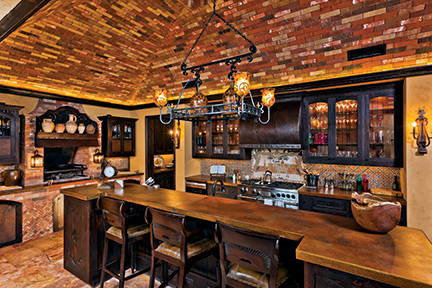 When Urban Home Magazine owner Louis Doucette went with me to photograph the ranch, Louis told me that it was my best work and then corrected himself to tell me that it was the best work he had ever seen. 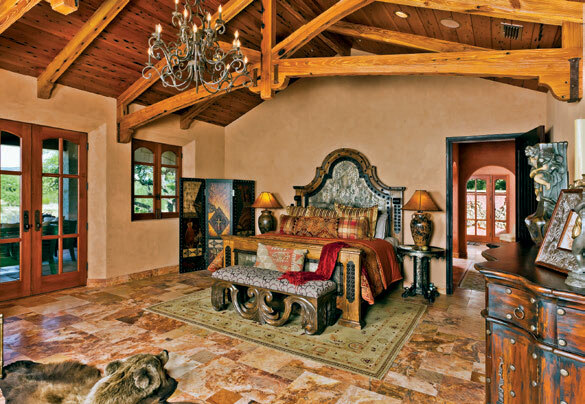 Take a close look at the details of the Martin Ranch project in the January 2014 issue and come see us at Catrina’s Ranch Interiors in Boerne. No job is too big or too small. No idea is too far outside the box when making dreams come true. When it comes to building and decorating homes, this ain’t John and Betty Martin’s first rodeo. When the couple met and married in 1978, John’s work in the oil and gas industry took them to Houston from their native Mississippi. In the ensuing 36 years, their home base in Katy was joined first by a ranch in Wharton, then a lake house in Canyon Lake. The weekend getaway spots fulfilled the Martins’ yearning for, as Betty puts it, a return to “the country style of living” that these rural-raised transplants had grown up with and wanted to share with their own two children. Once the kids were grown and married, the Martins sold the ranch just outside Houston and began a quest to find a larger property, ideally about 2,000 acres. 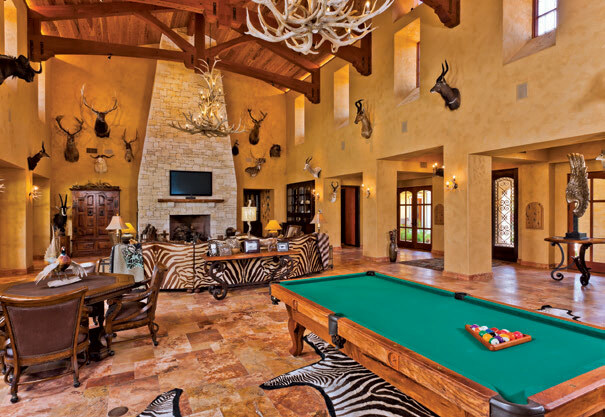 Additional must-haves beyond size included space for John’s big-game trophies and live-water access for wildlife; most of the couple’s other requirements were architectural or design-based. “We wanted a home that fit the beautiful hills of Texas where the American Indians had lived,” Betty says. But it wasn’t until John stopped in to visit a friend in Utopia while on a hunting trip that he — and soon Betty — realized that they had found their promised land. It was in this, the southernmost corner of the Hill Country, where they found the ranch they would dub Kemosabe, the backdrop for the dream home it would take them years to plan, build and decorate. And what a home it is. 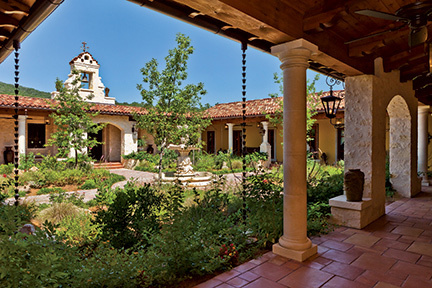 Incorporating influences from Spanish-style haciendas and classic ranches of Texas and the Southwest, the 17,000-square-foot stunner features rough-beam ceilings, dark wood and heavy iron accents, and dramatic touches throughout — arches, stained-glass windows, richly detailed boveda ceilings, and statement pieces such as the stand-alone copper vanities in the bathrooms and the colossal 7-foot antler chandelier over the pool table. Built around a large center courtyard, the home’s outdoor living features are as comfortable as those indoors. As artistic as it is inviting is the infinity-edged “spool” — “bigger than a spa, smaller than a pool,” Betty says. Regularly spaced nichos display crosses, pathways meander, and a prominent tower facilitates stargazing. The outdoor gardens are xeriscaped to be water-friendly — one of many “green” features of the property, which also include reclaimed wood and rafters, walls plastered with earthen clay, hand-made clay tiles, geothermal heating and cooling, and double-paned windows and doors. The first step was to address drainage and lay out the house accordingly. But despite the magnitude of the project and possibility of things going wrong, she insists that “God truly blessed” the entire process and says she is in awe of the dedication of the contractors, subcontractors and vendors, whom she calls “the cream of the crop.” Like Betty, Ramsey found the home’s remote location to be the biggest challenge. From the transport of supplies to the overseeing of workers, the intricacies of constructing the mammoth showstopper required extensive forethought and planning. And that’s before the interior design process even began. 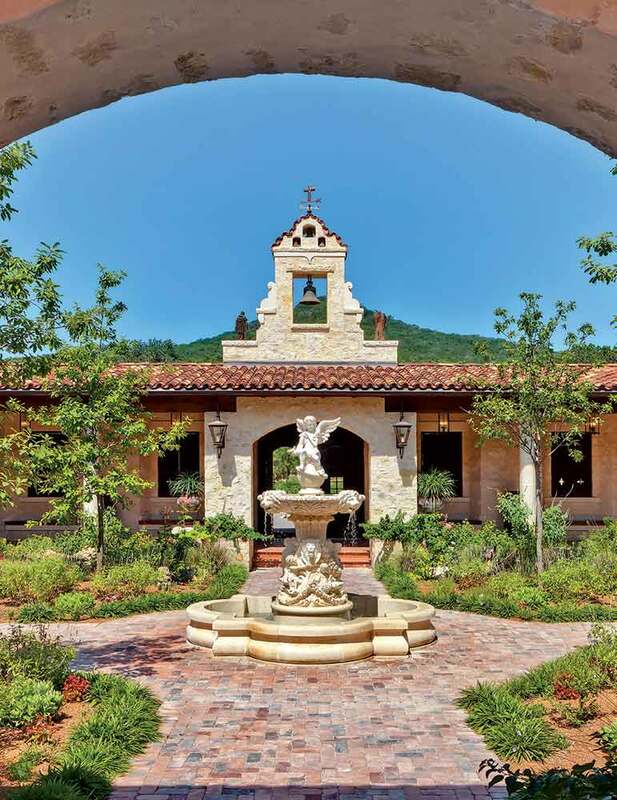 Betty Martin is as apt to talk reverently about all of the craftsmen, contractors and suppliers who worked on her home’s features, from the 10-foot Mexican limestone fountain in the courtyard to the outdoor fossil art wall, as she is to want to bask in the grandeur of the finished project. That’s not surprising, given its scope to rival that of the Taj Mahal. But having been so intimately involved in the process has given her an even greater sense of pride in ownership of her dazzling dwelling. “It’s hard for me to pick out the part of the project that I love the most,” she says.